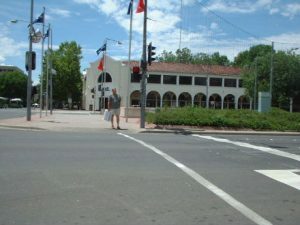 In every state, a pedestrian essentially has the right of way if crossing the street in a crosswalk, marked or unmarked, so long as the pedestrian did not suddenly dart out into the street or step off the curb without giving the approaching motorist a reasonable opportunity to yield and stop. The law states that both motorists and pedestrians have a legal duty to exercise due care when either operating a motor vehicle or when crossing the street. This means that a driver in a residential or urban area where there obviously pedestrians must be cautious and on the lookout for pedestrians. For pedestrians, they have a duty as well to not walk in front of oncoming vehicles, to not cross in the middle of a street or to walk against a “Do Not Cross” sign or red traffic signal, and to be very cautious if walking on a roadway. They should also refrain from walking in areas where they are prohibited by law and there are clear signs to that effect. Particular care should be exercised by both at night and especially on poorly lit streets. But what happens if there is a pedestrian accident outside of a crosswalk? Is the motorist still responsible for any resulting injuries to the pedestrian or did the pedestrian waive any right to compensation in this instance? 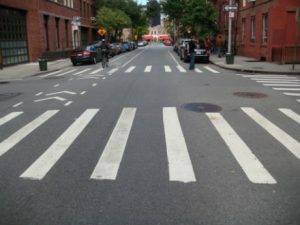 In many cases where there is a pedestrian accident outside of a crosswalk, both the motorist and pedestrian may be found at fault but it may depend on where the pedestrian was crossing and what the motorist was doing. For example, if the pedestrian was only a few feet outside a marked crosswalk, he or she may be deemed to have been crossing legally. Even if a walkway was not marked or lined on the road surface, if the pedestrian had no other option but to cross at that particular intersection and did so as to give the motorist sufficient notice of his or her presence, then the motorist may well be deemed totally at fault if a reasonable driver under similar circumstances would have seen the pedestrian and stopped in time. Jaywalking is unlawful. It is carelessly crossing in the middle of the street or against a red light or “Do Not Cross” signal. Although the fines are insubstantial, you risk serious injury or death and may not be able to collect any compensation for your own reckless or negligent behavior. In most other cases, both parties may be at fault for not exercising reasonable caution. A motorist should know in certain areas that there are pedestrians who will be crossing the street, children playing or suddenly darting out if in a suburban residential area or neighborhood where there are bus stops, grocery stores, or bars. Pedestrians should also not place themselves in hazardous situations or assume that motorists will see and stop for them especially at night or in snowy or rainy weather. Also, a fair number of motorists drive while impaired by alcohol or drugs, especially in the evening hours, weekends, or during holidays. Talking or texting is not uncommon and many motorists engage in this practice when driving slowly in a residential or urban area. Texting while walking in front of a motor vehicle or above ground T trolley call could result in an injury that the pedestrian would be responsible for. A pedestrian who is intoxicated when stepping out into the street is not excused for such behavior. Contact a pedestrian accident lawyer if you are deemed at fault for an injury accident. All states have some kind of comparative fault law where the injured parties may either not recover because of any particular degree of fault in causing the accident and their injuries. Some have laws known as pure comparative fault where a party may recover some compensation but reduced by their percentage of comparative fault, or they may only recover if their degree of fault was less than 50%. Massachusetts has a modified comparative fault statute whereby injured claimants may only recover if their comparative fault was 49% or less. If both parties were equally at fault, for instance, the claimant recovers nothing. For example, if you were the pedestrian and the court or jury found you were 45% at fault and your damages are determined to be $100,000, you could recover only 55% of those damages or $55,000. If you were found by a jury to be 51% at fault or higher, you are barred from recovering any amount in Massachusetts. A pedestrian injury case is a personal injury matter where you, as the injured claimant, have a right to collect damages if the motorist’s negligent operation of the vehicle caused the accident and your claimed injuries. In many pedestrian accident cases, there are catastrophic, or fatal, injuries to the pedestrian who has no protection against the force of a 5,000 pound passenger vehicle, regardless of its speed at impact. Your recourse is against the motorist’s auto liability policy. If the driver was uninsured, you can make a claim against the uninsured provision of your own household policy if you have one. In some cases, a municipality may also be found at fault for not properly lighting an intersection or for its poor design that placed you in an unreasonably hazardous situation. Contact an experienced pedestrian accident lawyer like Neil Burns and Roshan Jain to handle your injury claim, especially if circumstances are such that the defendant’s insurer claims you were comparatively liable. Contact Burns & Jain today to discuss your legal rights and opportunity for compensation.